Good deals on DOT helmets? Discussion in 'Downhill & Freeride' started by thad, Jan 7, 2013. I need a new helmet. I want a DOT helmet, as I have had a few concussions and want to get a dirt bike. I found Troy Lee Air for $165, down from $330. Only available in the delta scheme, blue/white or black/white. Are there any other deals I should be considering? In the $150ish range. Thad, it's your head. Don't go budget. You mean dirt bike, as in motorcycle? If so a DOT helmet really should be minimum requirement. I personally don't get on any thing with a motor without a SNELL approval as well. If you've had multiple concussions I seriously wouldn't recommend anything less than Snell approved. You only get one brain. I really don't think its possible to overspend on a helmet. You really do seem to get what you pay for. I as well as the engineers at Bell and several other companies will disagree with you on the Snell approval. Snell was developed for road racing at nearly 200mph so it has harder foam inside. As a result the lower speed and less severe impacts that MTB and Dirtbike guys experience more frequently actually have more energy transferred to the brain/head which results in more concussions. Your best bet is for a MTB DH specific helmet which has its own safety standard. Good budget option is the Giro full face. Unique and technologically advanced Aerospace carbon / composite shell construction. Meets SNELL, U.S. DOT and ECE standards. Though it doesn't have the dual density EPS foam, like SE3 and D3, or Shoeis and Arias. Hmmm. I saw palmer D3's for $250. I would rather have a DOT/snell helmet so I can use it on a dirt bike. i am very happy with my poc mips! there are multi crash shell inside! i got two head crash, and it absorb perfect. I've got one as well and am really pleased. Downsides to it are cost and wonky sizing. 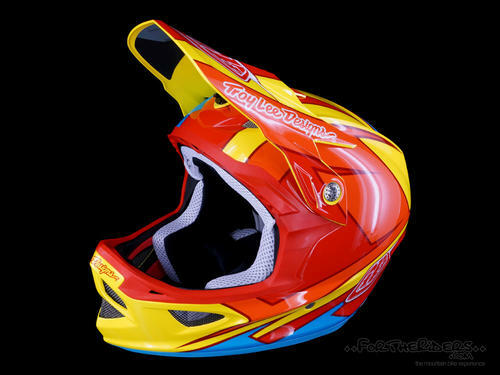 TLD air is a solid helmet. Rock it. I suppose that could be true. I only crash my motorcycle on the street or Forest Service roads so YMMV. I am still considering the TLD air, but not sure that I need Snell. I am leaning toward this D3. Can get a good deal on the stinger, in captain america or this color scheme, which is kinda loud. Not exactly the same thing but I ride my snowmobile regularly at 70mph with my D3. Chinbars in hardpack snow at high velocities are pretty fun. Haven't really nailed a tree or a rock yet. I'll report back tomorrow after I nail my head on a tree or a rock since I was stupid enough to just type that out. edit: try one on before you buy it. They fit kinda weird (IE not like a D2 at all). I had to compress a bunch of foam in mine to get it to fit right whereas D2s fit me perfectly. i have bought a fox V2 from them recently.... my first DOT helmet for the mountain bike. broke my right collarbone less than 5 rides after that... i think it had to do with the lower part of the helmet impacting my collarbone. DOT helmets tend to lower than the jaw, compared to full face bike helmets. in my particular case, it might have contributed to the injury. i doubt my previous helmet would have impacted my collarbone (or at least that hard), since the lower part of the chinbar sits a bit higher. i didnt consider that, so get a leatt, if you for for the moto helmet; and test as many as you can. in my case, a XL 661 or fox fits me well. but XL TLD air or se DO NOT fit at all. Then you shouldn't be on a d3. You don't compress the energy absorbing foam to get a helmet to fit you correctly, you get a diff helmet...seriously. On the same line, d3 fits me perfect, d2 was like a square peg in a round hole. Then you shouldn't be on a d3. You don't compress the energy absorbing foam to get a helmet to fit you correctly, you get a diff helmet...seriously. Let's see this is something like my 150th helmet between bmx, skateboarding skiing etc. How thems work again? If it was anything but minor I wouldn't have done it. Minor? You just said you had to compress "a bunch of foam", so which is it? I went through it with an angle grinder and took off about an inch and a half of foam. Then I drilled a few holes in it for 6 different gopro mounts so that all of my awesomeness is fully covered. Then sanded off the shiny coating blocking all the really cool carbon and I kept the shell out in the sun on one of the 10k peaks around here for a year before wearing it. Two thumb sized indentations no more than a millimeter deep.